Cross breeding and GMO (Genetically Modified Organism) are two types of techniques used in agriculture to develop animals and plants with desired characteristics. The main difference between cross breading and GMO is that cross breeding is the mating of two organisms from two breeds whereas GMOs are the organisms whose genetic material is altered by genetic engineering. The main advantage of cross-breeding is to mate two genetically-related organisms that are never crossed naturally. At the same time, genetic engineering introduces some tremendous and elite qualities to GMO. Cross breeding refers to the mating of two different species, variants or breeds. A breed refers to an interbreeding group of organisms within a species with a common appearance and behavior. Generally, a breed selectively reproduces only within the group. By the mating of two different breeds, a new organism can be produced with hybrid vigor. The hybrid vigor or heterosis is the tendency of the crossbred animal to exhibit the qualities superior to either parent. In animals, cross breeding is used to increase the production, longevity and fertility. It is done by artificial insemination. For example, cross breeding can be used to increase the milk production of cattle. Different breeds of dogs and horses are used in cross breeding to produce new breeds with desired traits as well. 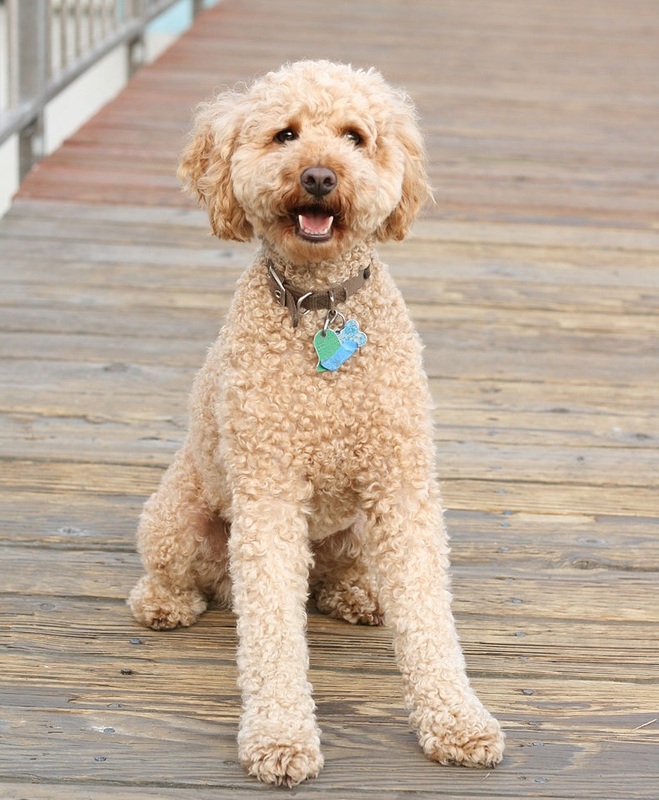 An example of a crossbred dog is shown in figure 1. Plant cross breeding can be done by cross pollination of two distinct plant strains of the same species. The resulting interspecific F1 hybrid may exhibit intermediate characteristics of both parent plants. The pollen grains of one plant breed are deposited on the stigma of the other plant breed to achieve a cross-bred. This technique is known as cross pollination. Cross pollination is quite easy in dioecious species. GMO (genetically modifies organism) refers to an organism whose genetic material is altered by the techniques of genetic engineering. It is produced by the introduction of one or several genes of a particular species into a completely different species. Farm animals, crop plants, and soil bacteria are subjected to genetic engineering to produce GMOs. GMOs are produced to optimize agricultural performance, to decrease the susceptibility to diseases as well as to produce important pharmaceutical substances. For example, salmon fish have been genetically engineered to grow larger, and cattle have been engineered to show resistant to mad cow disease. 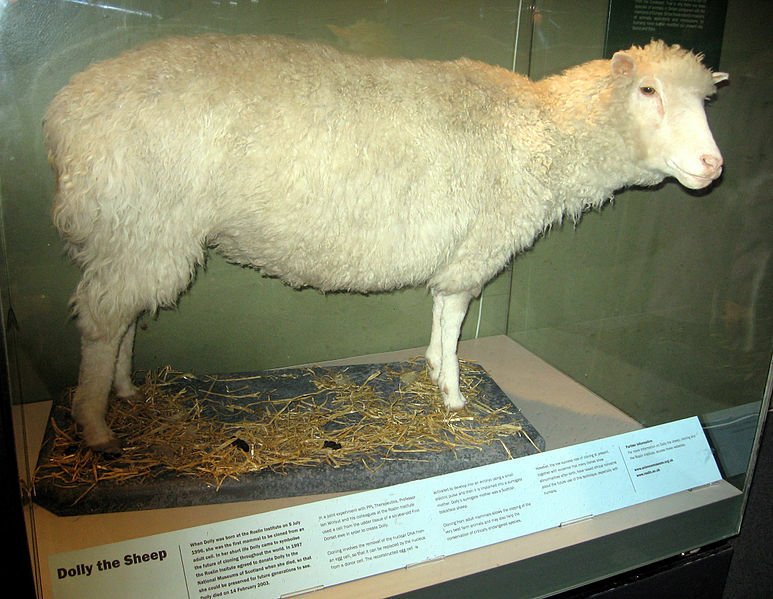 Dolly, shown in figure 2, was a female domestic sheep born as the first animal clone. The agricultural plants are the most frequent examples of GMOs. Genetic engineering is used in crop plants to enhance the nutrient composition and the quality, resistance to diseases as well as pests, crop yield, and food security. Genetically modified plants may also mature faster, tolerate drought, salt, and frost. Soybean, corn, canola, plum, rice, tobacco, and maize are some examples of genetically modified plants. 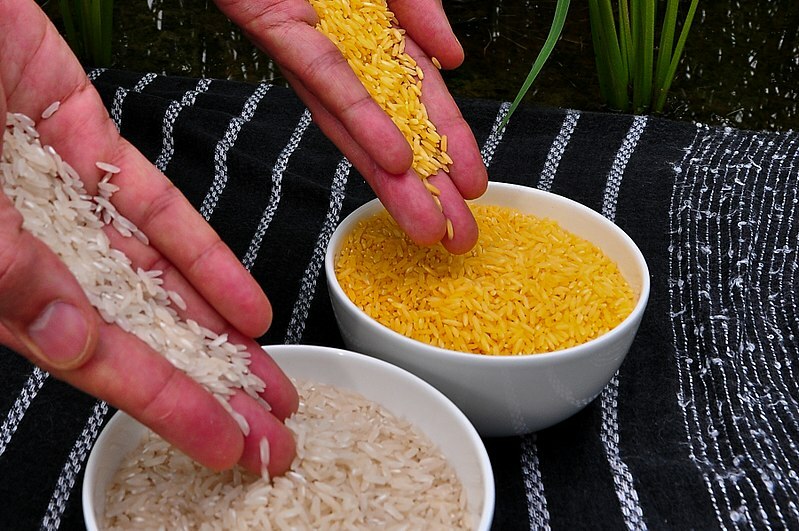 Genetically modified golden rice grains are shown in figure 3. Genetically modified soil bacteria are used in the production of pharmaceutical substances, clotting factors, hormones, enzymes, and biofuels. Cross breeding and GMO are two types of techniques used in agriculture to produce plants or animals with desired characteristics. Both cross breeding and GMO are artificial techniques performed by the man. Cross Breeding: Cross breeding refers to the mating of two different species, variants or breeds. GMO: GMO (genetically modifies organism) refers to an organism whose genetic material is altered by genetic engineering techniques. Cross Breeding: Cross breeding is the artificial mating of genetically related organisms from two breeds. GMO: GMO is produced by the alteration of the genetic material of an organism by genetic engineering. Cross Breeding: Cross breeding of animals is done by artificial insemination. Cross breeding of plants is done by cross-pollination. GMO: GMO is done by genetic engineering. Cross Breeding: Cross breeding can be performed between distinct breeds of the same species. GMO: GMO may be introduced with genes of another species. Cross Breeding: Cross breeding can be used to mate two genetically-related organisms that are never crossed naturally. GMO: GMO is produced through the introduction of some desirable traits to an organism. Cross Breeding: Breeders have to cross plants over multiple generations to produce a desired trait. GMO: The desired trait can be produced at a single time by genetic engineering. Cross Breeding: Cross-bred organisms have weaknesses such as infertility. GMO: GMOs are sometimes coupled with disease susceptibility. Cross Breeding: Cross breeding done to increase the milk production in cattle is an example. GMO: Salmon that have been genetically engineered to grow larger is an example of GMO. Cross Breeding and GMO are two techniques used to produce new organisms with desired traits. Cross breeding is the mating of two pure breeds while GMO is the alteration of genetic material of an organism. 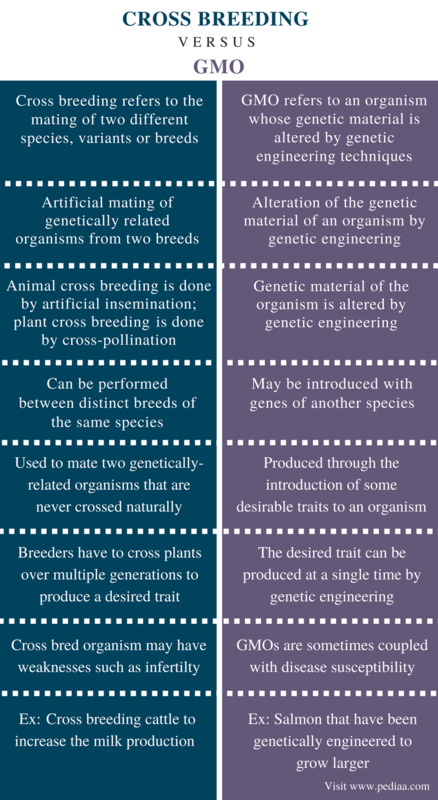 The main difference between cross breeding and GMO is the mechanism of each technique used to produce a beneficial organism. 1.“CROSSBREEDING.” AHDB Dairy – Working on behalf of Britain’s dairy farmers, Available here. 2.“Genetically Modified Organisms (GMOs): Transgenic Crops and Recombinant DNA Technology.” Nature News, Nature Publishing Group, Available here.